"I want to show Shinji mankind's bright future." "I want to show Shinji mankind's bright future." Some think of her as the true creator of the Evangelions. But whatever you think, Yui Ikari genuinely believed that her work was for the benefit of humanity. Not only was she a brilliant bioengineering scientist, but also she was a loving wife and mother. Her love for Gendo Rokubungi (later Gendo Ikari) was such that she was willing to forgive some of her husband's eccentricities during the time they were dating (like getting drunk and starting fights). 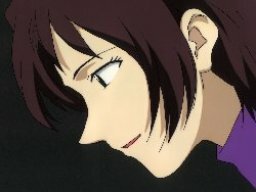 Yui's death in 2004 during an Evangelion test (for which her four-year old son Shinji was present) had effected Gendo greatly... so much that he was willing do deify SEELE and utilized the resources of the Gehirn Project (later known as NERV) to try to get her back. What was believed to have happened was that Yui's soul was incorporated in Unit 01. It could explain some of the anomalous behavior had exhibited... namely protecting Shinji Ikari and rejecting both Rei Ayanami and the "Dummy Plug" (which was based on Rei) when Shinji left NERV prior to the attack of the 14th Angel.